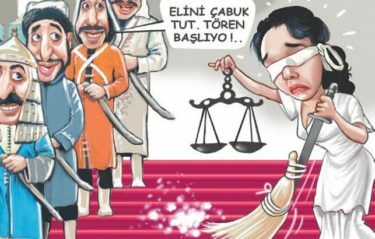 Musa Kart, cartoonist at the Istanbul daily ”Cumhuriyet”. Geneva, May 3rd, 2018 – On the occasion of World Freedom of the Press Day, the Swiss Foundation Cartooning for Peace / Dessins pour la Paix in- augurates its Biennial Exhibition in Geneva today and awards its International Press Drawing Prize by the City of Geneva to famous Turkish caricaturist, Musa Kart. Erdoğan. With the accusation of ”association with a terrorist organization”, the court of Silivri sentenced him to three years and nine months in prison on April 26, 2018. 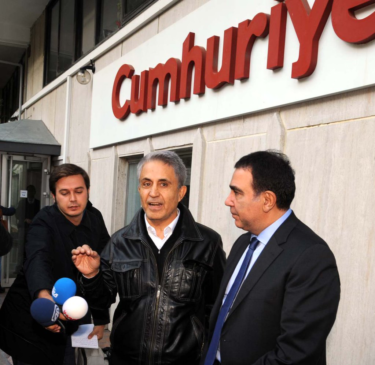 Like fourteen of his colleagues journalists at Cumhuriyet, also sentenced to heavy prison terms, he has not been detained pending appeal but remains subject to judi- cial review and to a ban on leaving the country. ”In 2012, by creating this International Prize with the City of Geneva, we wanted to salute the talent and the courage of sisters and brothers working in countries rather averse to political satire. What we did not imagine then, was that the air of freedom would become rarefied so close to us, and so quickly. In 2018, 70 years after the Universal Declaration of Human Rights, 85 years after the birth of the Turkish Republic, this prize for freedom of expression goes to a citizen of Istanbul, a free spirit and a remarkable artist”, said Swiss cartoonist Chappatte, Vice-President of the Swiss Cartooning for Peace Foundation. ”Musa Kart is a witness but above all a victim of the deterioration of freedom of expression in Turkey and risks a long prison sentence for his drawings, which are critical of the government. Turkey is no exception and there is a long list of countries where press professionals risk their lives and their free- dom to witness to the reality that surrounds them and to inform the world”, adds Plantu, the French cartoonist at Le Monde, Founder of Cartooning for Peace. For Guillaume Barazzone, administrative advisor of the City of Geneva and member of the jury, ”freedom of the press remains the marker of democ- racy and the last buoy before autocracy and arbitrariness. In a globalized, interconnected world, in the eyes of the world, the power of a nation is also measured by the freedom it gives to the press and his ability to face criticism and engage in dialogue with citizens. The City of Geneva is proud to be as- sociated with this prize since its creation”. At a press conference on May 3 at 11:30 am at the Swiss Press Club, Ms. Hesna Kart and Ms. Seran Üney, wife and daughter of Musa Kart, will speak on his behalf and the Executive Director of Human Rights Watch, Mr. Ken- neth Roth will engage in dialogue with Iranian cartoonist Mana Neyestani, laureate of the 2012 International Press Drawing Prize, who is now living in exile in France. The International Press Drawing Prize of the City of Geneva and the Car- tooning for Peace Foundation honors courageous and endangered press cartoonists every two years because of their art: Gado of Kenya and Zunar of Malaysia, winners in 2016, Hani Abbas from Syria / Palestine and Doaa El-Adl from Egypt in 2014, Iranian cartoonists Firoozeh, Hassan, Kianoush and Mana Neyestani in 2012. The Jury of the International Press Drawing Prize is composed of Guillaume Barazzone (City of Geneva), Kenneth Roth (Human Rights Watch) and Press Cartoonists Plantu (Le Monde), Chappatte (Le Temps, The New York Times, Neue Zürcher Zeitung) and Liza Donnelly (The New Yorker).